Remember playing those “what’s wrong with this picture” games in activity books when you were a kid? Well WorkSafe BC has adapted the concept as a safety tool. Every issue of WorkSafe Magazine includes a photo that has been staged to show at least six hazards or dangerous work habits – you can interact with the photo to position pushpins on identified hazards, describe the hazards, and then submit your response to WorkSafeBC for a possible prize (although it’s likely that only B.C. residents are eligible). In each issue, they include the winning entry from the last issue, along with responses from other readers. Neat. 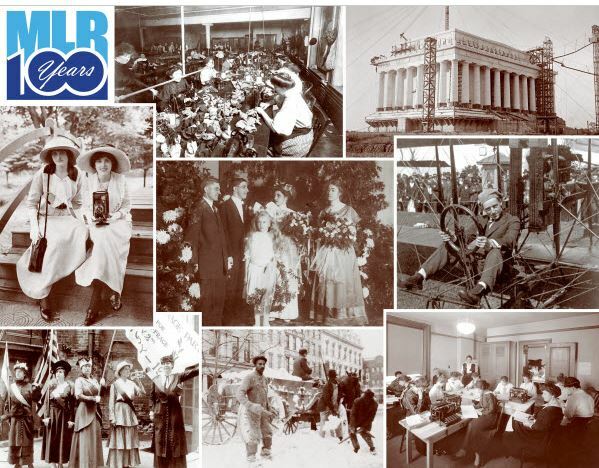 One of the really cool and useful things is that they keep an archive of all past photos online – you can either take the challenge online and then check the answer key, or you can print the photos and the answer keys and use them in safety meetings or toolbox talks. 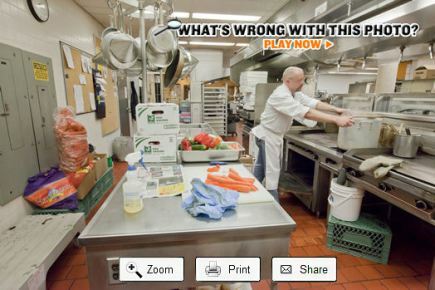 Here’s one example: Can you spot the safety hazards in this commercial kitchen? Note: the image below is only a sample pic – the online interactive version is accessible at Kitchen Safety and here’s the commercial kitchen answer key to check your responses. In searching for some safety videos, we chanced upon these vintage clips about workplace safety for women and supervising women, which we pass along for your amusement and elucidation. We’re happy to note that in the ensuing years, there have been significant advances for both women and for safety! If you were one of 20,000 women employed in a non-domestic job in Boston in the 1880s, you probably worked a 10-hour day, six days a week and earned $6.03 for your weekly labors. You didn’t have very much time off. If you were among the lucky one in five working women who had any vacation time at all, you probably didn’t get paid. If you had a holiday, you were likely docked in pay. If you worked for one of the larger employers, you might even be docked in pay for being as little as a single minute late to work – in some instances, fines might be levied. And if you needed to be out sick, at least some jobs required that you find a substitute worker. This profile was garnered from a 130+ page report entitled The Working Girls of Boston that was published in 1989. It’s available online in its entirety from the Harvard University Library. The report was compiled from the 1880 census and from interviews with 1,032 working women. While most workers described their working conditions as satisfactory to good, a very different picture emerges as you continue reading. Many complained of tiredness from climbing “four, five, six, or even seven flights” to reach higher floors in buildings with poor egress and lack of fire escapes, a foreshadowing of the Triangle Shirt Waist Factory Fire. Other complaints pointed to the stamina needed for long hours spent standing or operating manually powered equipment. The report focuses less on safety and injuries and more on the overall effects of work on general health, referring frequently to tiredness, nerves, exhaustion, or women being run down and needing rest after being on the job for a period of time. Medical conditions like blood poisoning, consumption, and lung problems were also reported. There were complaints about poor ventilation and crowded conditions, referencing exposure to dyes that cause “acid sores” on the fingers and dust from sorting feathers, straw, or cotton. Exposure to lead dust in foundries was common and thought to be unhealthy, resulting in “girls and men having little or no color in their faces,” and even some reports of girls having died from the effects. In fish packing plants, girls stood in cold water, and wore the skin off their bare hands from handling fish packed in pepper and saltpeter.